Incidentally, did you know it’s a long way from southeastern Idaho to southeastern Texas? I made the drive last week, and I’ll be making the drive back as soon as I can get some things FINALLY done around here. On the upside, it’s kind of a fun, if long, drive other than Wyoming’s tendency towards having ridiculously high winds and roads paved with what appears to be a mixture of wet ice and motor oil. I made it down here though, but I’ve already been delayed about a week due to some issues getting inspection arranged on the home we’re trying to buy out here. But you didn’t come here to read me whining about that, did you? On the way down, I did manage to stop at one of the two Colorado breweries mentioned in the “Wildbrews” book. New Belgium Brewing Company just happened to be only a couple of blocks away from my route through Fort Collins, so I took the opportunity to stop by and check them out. If you’re familiar with them at all, it’s probably for their “Fat Tire” amber ale which I have seen in stores around the country, but I didn’t care about that. What I cared about is that they actually let their microbiologist (and, it turns out, their other employees too) play, and they have experimental “sour” beers in the same general style as Belgian lambics. Pictured at left is their famous one – “La Folie” (“the folly”). 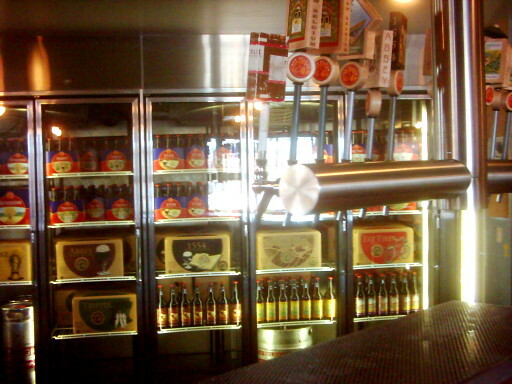 Well, the label on the tap for it, anyway. I’m not certain if cultures other than the standard canned strains of Saccharomyces cerevisiae are used in the initial ferment, but they then move the brew over to barrels that were previously used to age wine, and which no doubt contain a variety of traces of live lactic acid bacteria, other yeasts, and the like (their website also suggests they directly inoculate the beer with lactic acid bacteria as well). The brew sits in the barrel for up to 3 years. The result is nicely carbonated, and tastes almost sweet to me due to the pleasant tartness of the lactic acid. This particular brew is mentioned in the book. Seeing my obvious enthusiasm for the style, I was also allowed to taste a more recent concoction. “Eric’s Ale” was a lighter sour brew made with peaches which I absolutely loved. 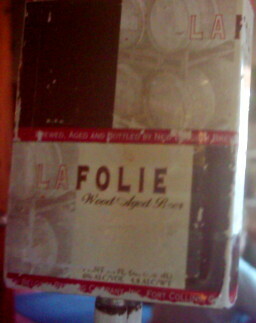 I really wish they’d had it in bottles for me to buy, but neither it nor “La Folie” were available in portable form, as far as I could tell. Guess I’ll just have to make my own. Once I finally manage to sit in one place long enough to try, dangit. It was the Belgian Lambic-style ales that convinced me that I really do like beer after all, so long as it isn’t mass-market commercial swill (“Bladderwash”, as Leon Kania, author of “The Alaskan Bootlegger’s Bible” calls it) nor too strongly hops-flavored. I did taste their “1554” ale – a “black ale” style that they were able to date back to at least 1554 while doing research on the style in Belgium, and several others whose names I don’t recall at the moment. One brew whose name I don’t remember was spiced with Yerba Mate – a caffeine-containing South American herb also found in Celestial Seasoning’s “Morning Thunder tea. (Ethanol is nice and all, but methylxanthines are my favorite…). And, no, I didn’t forget their names because of drunkenness. When I say “taste” I mean I had a sip or two of each variety I sampled. They had these nifty little glasses like miniature brandy snifters for tasting. I’ll need to get me a set of those one of these days. 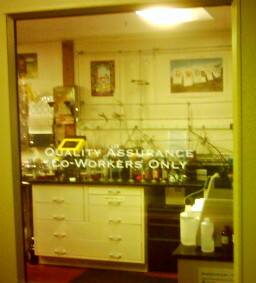 An unrelated bit of spiffiness about the brewery is that they seem to run the place as “green” as possible. They even go so far as to subject their brewing wastes to bacterial fermentation to produce methane, which they use to heat their water. How cool is that? On a final, still unrelated note: there’s evidently been a fad of people selling things on eBay that have shiny surfaces, such as metal teapots. The trick is to take the picture of the item while naked, and standing such that one’s reflection is just visible in the picture of the item that appears on eBay. 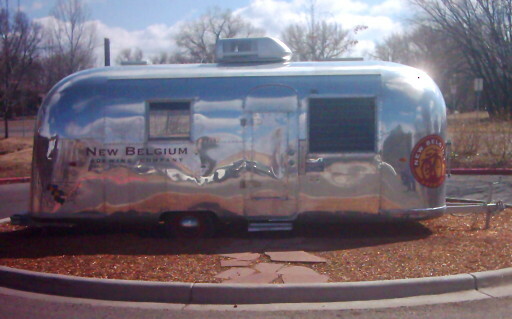 You know those classical shiny aluminum “Airstream” camping trailers? They had one out in the parking lot. 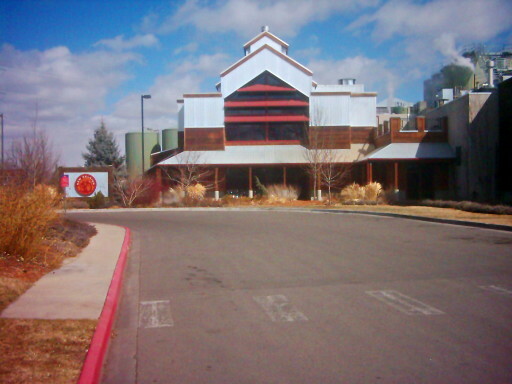 The other “wild brew” place in Colorado is the Bristol Brewing Company in Colorado Springs. Unfortunately, the only indication I can find of their “wild” brews is a “sour beers” class they did as part of their recent “beer college” series, and a “Skull ‘n Bones” (evidently what they were calling their sour-beer series) T-shirt. As there is also no mention of brewery tours, I did send an email off to the person who appeared to be the contact for such questions, but I’ve yet to hear back. I’d love to stop by on the trip back, but the route will add a couple of hours to the overall trip. This would be well worth it if they’re doing tours, or still doing “sour” beers, or if I could even spend a few minutes chatting with their microbiologist. If not, though, I’ll just have to get on with working on it all myself. Oh, yes, and the place in Austin that I previously mentioned was called “The Bitter End”…and it ended. Apparently a fire destroyed part of it, and now its being demolished to make way for a massive chain-hotel building. How sad. Previous Previous post: Drugs make you stupid. And so does fear.